Grant is five. He was walking alone to the garage to help me with a chore. Before I knew it, he came back with a look of fear. “I think it’s just the acorns hitting the garage roof,” I said, trying to calm him. It didn’t seem to help. I decided to hold his hand so we could face this dragon together. Within a few steps of us walking on the crackly leaves, the light bulb went on. 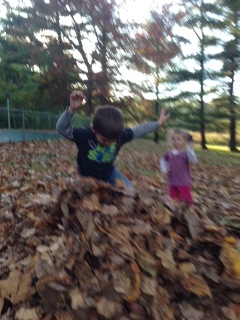 “It was just the leaves; it was definitely the leaves,” he said confidently. Why couldn’t he figure that out when he was alone? How did my presence help him discover the origin of his fear? Over the past few years, I had been attempting a few chores myself for God and the dread I’ve been feeling seems awfully real. That Grant’s very feet were the source of the noise that caused the fear was an analogy the best writer couldn’t have made up. In other words, it’s our very steps of faith that cause us anxiety. The obvious solution? Stop walking. The drawback? We start disobeying. Woe is me! What’s my excuse when there are no leaves on the ground? I guess if fear actually drives us back to Pop for a little handholding, that’s OK. Perhaps that’s His Plan B all along. Pretty smart Pop. Or maybe He just likes a good walk with His kids? “The Lord stands beside you…keeps you from all evil..The Lord keeps watch over you as you come and go [over the noisiest leaves]. Psalm 121:5,7,8 – Brackets mine…and Grant’s. LEFT: IN ALL FAIRNESS TO GRANT, THESE ARE THE CRUNCHIEST AND LOUDEST LEAVES I’VE EVER HEARD. RIGHT: “LEAVE-ING” FEAR BEHIND, FAITH JUMPING ON FEAR! My Sunday sabbath and Autumn in my upstate back yard beckoned me like a kid that asks, “Can you come out and play?” The rusts and golds and crisp air… you know the scenario: it’s a gorgeous day or time of year and the outdoors seem to hold out this gigantic “Welcome” sign. You want to tackle that mountain trail, go for a walk in the woods, get the bike out, take the kayak out, walk the dog, let the kids play in the backyard or a playground, go for a jog…whatever. Call it “beauty and the beasts,” but Lyme is one of the greatest paradoxes of my life. Lyme is ugly because, in its worst forms, it debilitates or at the very least, brings people physically and mentally low if not treated fairly quickly. Why is it that the most beautiful is always opposed by the most ugly? It doesn’t only happen with these exasperating little creatures. It happens indoors, as well. You want to love your spouse, but something small gets in the way – constantly!! You’re inclined to better-understand your kids and your “understanding” just got misunderstood for the fortieth time. You want to do a good job at work but it’s not good enough. I succumbed to my sabbath walk in my back yard. I saw deer run back and forth on the path right below me as if they were showing off. I witnessed a bald eagle take off over the river. And I discovered a meandering waterfall. Utopia! And when I got home, I also discovered a tick climbing up my pants. The clothes immediately go in the dryer at high temperature and I go in the shower. I look out for them constantly. So, the next time I want to love my wife a little better, be a more understanding dad or get closer to my heavenly Father, I always check for the little beast. Unfortunately, he’s hard to see but with diligence can be found.